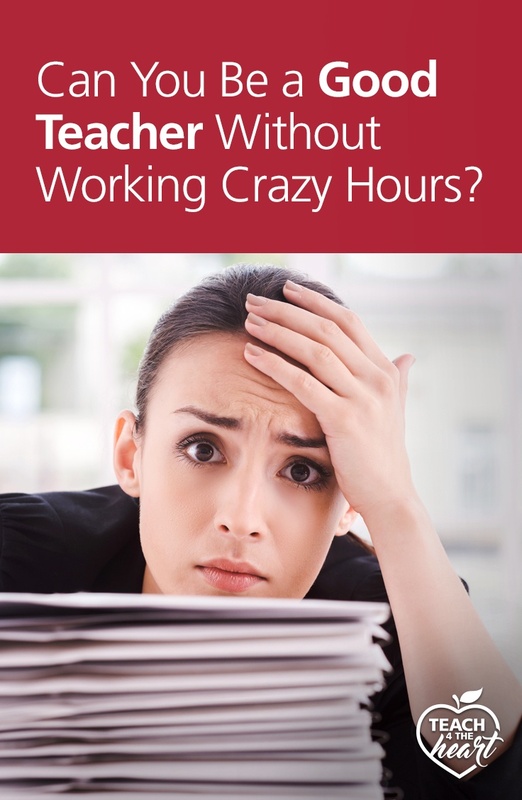 >> Can You Be a Good Teacher Without Working Crazy Hours? Can You Be a Good Teacher Without Working Crazy Hours? School has been crazy. You’ve stayed up way too late way too many times. You’re exhausted, you’re overwhelmed, you’re stressed. And you constantly feel guilty that you don’t have more to give to your family. Teaching is totally taking over your life. But that’s just how it is. If you want to be a good teacher, this is what it looks like. Par for the course, right? There’s a common line of thinking in teaching that says If I want to be a good teacher, I have to put in the time. But is that really true? Now there’s certainly an element of truth in the statement. Teaching is hard work. It requires prep and grading and creative thinking. And you can’t simply expect to show up with no planning and no preparation and teach with excellence. Maybe you know a teacher who tries to do that – show up with no prep and just wing it. They aren’t prepared, they don’t put in the time, and their teaching (and their students) suffer for it. So what do we do? We double down. We become even more convinced that we HAVE to keep putting in the time because we certainly don’t want to be like that. But what should “putting in the time” look like? Should it look like staying up till midnight every night to finish our amazing lesson plans? Habitually spending half our Saturday correcting papers because “our students need the feedback”? Should we always be short-changing our families because we HAVE to [fill-in-the-blank]? Must we constantly be working on school, yet never feeling done? No. This simply can’t be right. More time does NOT necessarily make you a better teacher. In fact, it could be HARMING your teaching. Wait, what!? Are you crazy!? Let me ask you this – When you work insane hours, are you energized or exhausted? Do you walk in to your classroom rested, excited, and composed – emotionally equipped to teach with passion and calmly resolve any classroom or interpersonal issues that come up? Or are you frazzled and on-edge, wondering how on earth you’re going to survive the day before it’s even begun? Let’s add another layer. What happens when all the time you’re devoting to teaching starts to take a toll on your other roles and relationships? 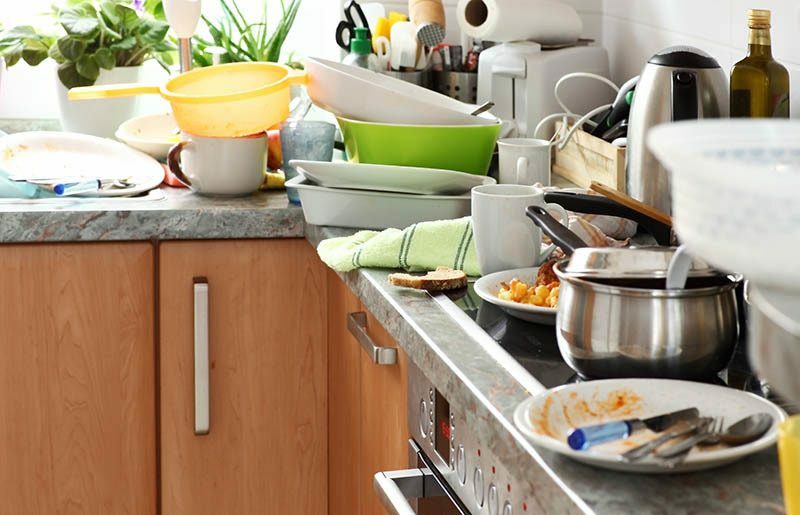 The laundry is piling up, the sink hasn’t been cleared of dishes in weeks, and you feel like a horrible wife/mother. 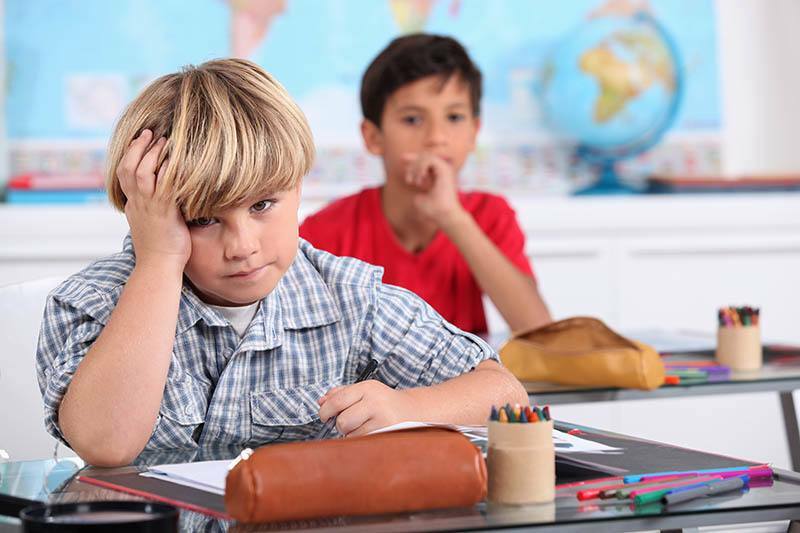 You don’t have time to help your own kids with their homework or ask more than cursory questions about their day. You’re too exhausted to enjoy an evening with your spouse – and you can’t imagine that changing anytime soon. How does that make you feel about teaching? Soon the job you dreamed about and loved starts to becomes something you resent. Oh, you still say you love it – because you really do WANT to love it – but it’s just too much. You’re not sure you can keep doing this. You’re headed straight for burn out. And if something doesn’t change, you may not even be a teacher in five years. Wait a second. Let that soak in. Left unchecked, your desire to be a good teacher – to put in the time for your students – could lead you AWAY from teaching altogether. And where does THAT leave your students? 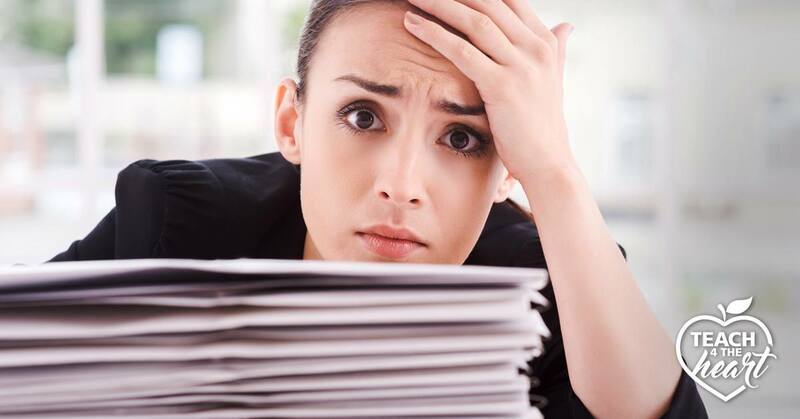 I submit to you again – spending too much time on teaching can actually HARM your teaching. But wait – there’s more! Let’s circle back so as not to gloss over something extremely important. 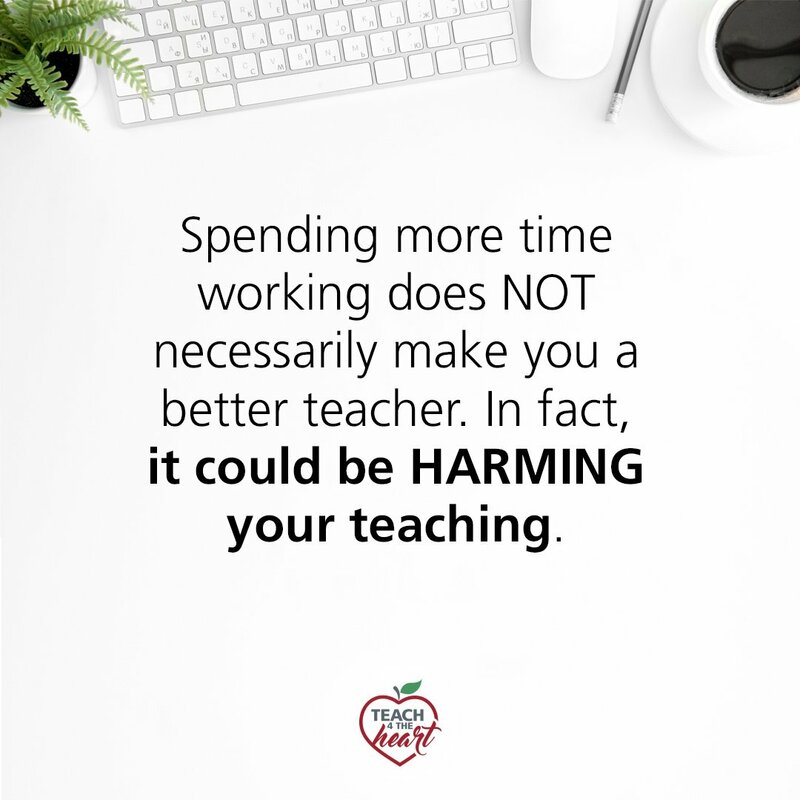 Aside from the damage to your demeanor and the very real danger of burnout, spending too much time on teaching can have devastating effects on your health, your relationships, your family, and your other God-given roles. Please hear me – your role as a teacher is vital. You have been called to an important task, a crucial mission. But teaching is NOT the only role in your life that matters. 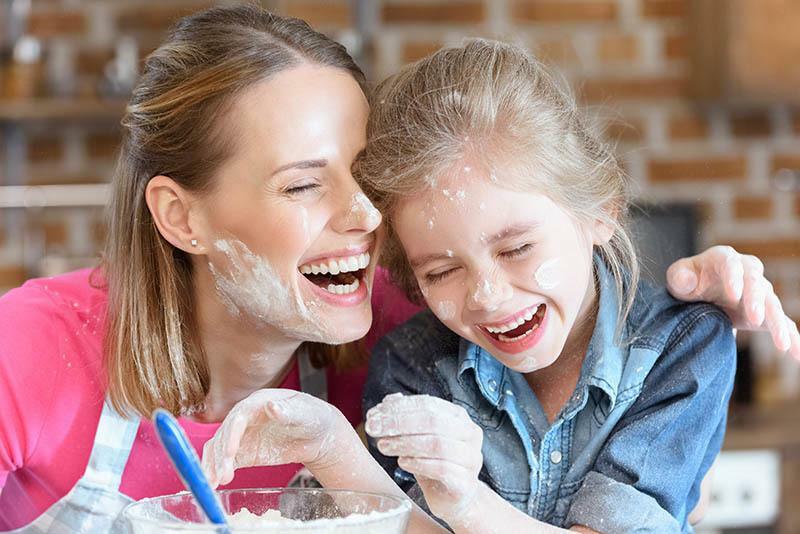 Other roles (like parenting) matter just as much – if not more – than teaching. So we cannot focus solely on “putting in the time for our students” and leave no room to put in the time for anything else. I could park here awhile, but for sake of time (see what I did there – wink wink), let’s move on. 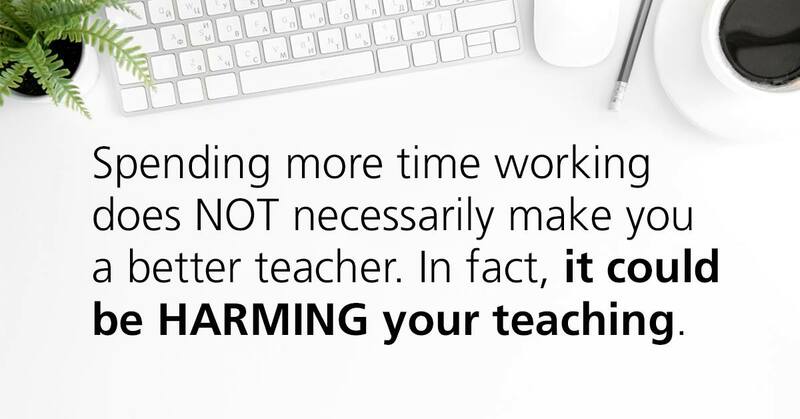 I hope you’re starting to see that “put in the time” CANNOT mean “let teaching take over your whole life.” But by now you’re probably getting frustrated. Okay, Linda. I get that I SHOULDN’T let teaching take over my life, but I have no choice. It really DOES take a ton of time to do _____, and there’s no way I can be effective without it. I totally hear you, but is there really no other way? Chance are there IS another option, another way to be just as effective in much less time. But in order to find it, you must do two things. First, you must make balance a priority. As long as you tell yourself you’re doing what you have to do, nothing will change. But as soon as you decide that you cannot keep going at this pace, that you have to stop working such crazy hours, and that you must somehow make time for your other roles, you unleash your creativity. I honestly believe this was how I was able to teach effectively without taking much work home. I constantly asked myself these questions and came up with tons of time-saving ideas as a result. That left me with time available to invest in the aspects of teaching that were important to me and that I wanted to devote time to. And that’s the great thing about this process. When you determine to make balance a priority and start seeking creative solutions to make it possible, you soon find yourself more in control of where you spend your time – and you’re able to choose to invest it in the things that matter to you – both personally and professionally. As you can probably tell, I get a bit fired up about this topic. It’s just too important, and I see too many teachers weighed down and overwhelmed when they just don’t have to be (or at least, not nearly to the extent that they are). For years I wanted to help but wasn’t sure how. Then my friend Angela Watson told me about a program she was designing that would teach teachers how to get everything done in a reasonable amount of time. I immediately knew this program was going to be amazing. 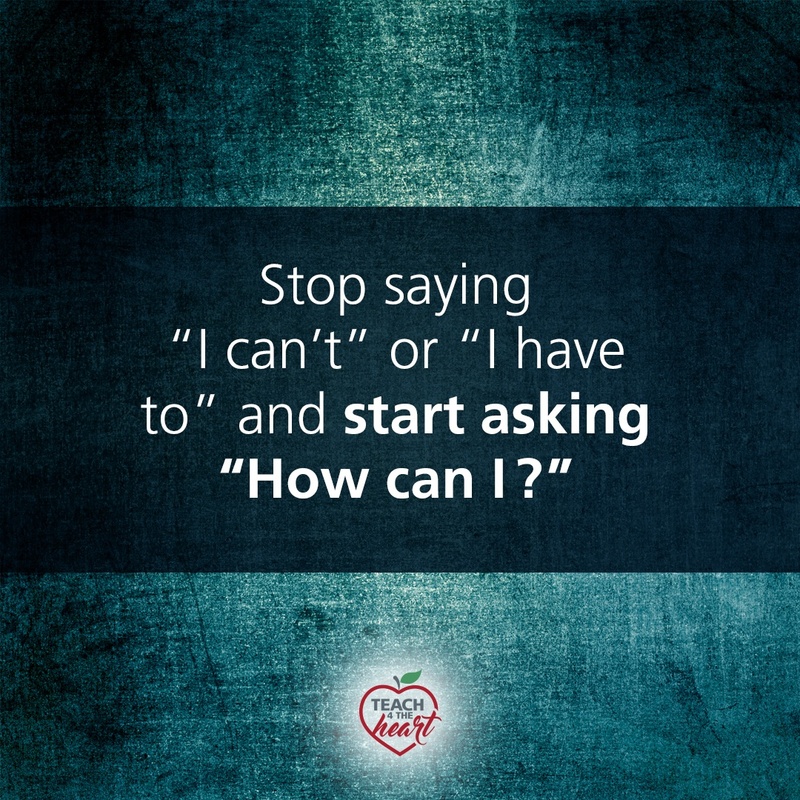 It was going to help teachers find workable solutions to all those “How can I…. ?” questions. It was going to create a framework to put teachers on the path to balance. It was going to free up time for the things that matter most. Needless to say, I was excited. And I have to tell you – she did not disappoint. I’ve been part of the program since day one and I’ve seen the results firsthand. Thousands of teachers are sharing their stories – of how simple tweaks to their routines are making their lives so much easier, of how they no longer lug home their overflowing teacher bags, and of how much time they’re saving (I’m talking 3, 5, even 10+ hours off their workweek). All while being MORE effective than ever. Crazy amazing stuff! Her program is called the 40 Hour Teacher Workweek Club – maybe you’ve heard of it. But before you tell me “I could never work only 40 hours,” (and I tell you to stop saying, “I can’t”), please realize that the club is NOT about the number 40 at all. The number 40 is designed to take you aback and get you thinking: Wait, 40? Is that even possible? How many hours do I actually work? SHOULD I be working that many hours? So if you’re ready to finally make balance a priority – and you’re thinking you could use some help answering all those “How can I…. ?” questions, I hope you’ll join us this summer in the 40 Hour Teacher Workweek Club. You can get all the details about the program here. 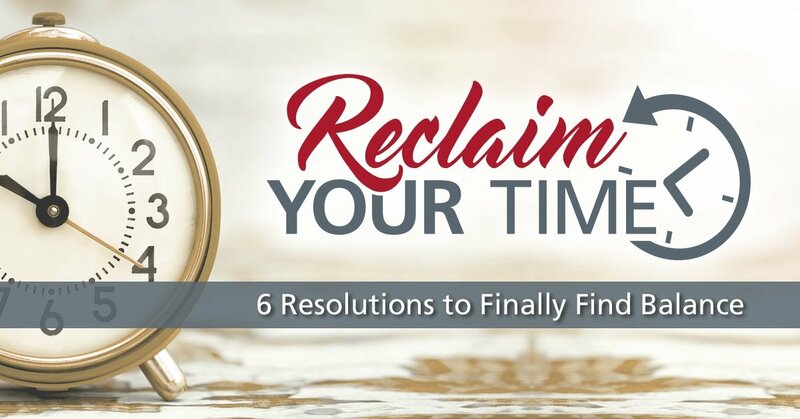 And since the club is only open for enrollment a couple times a year, join us in the meantime in our free Reclaim Your Time Challenge. In it, you'll make six resolutions that will help you be an amazing teacher without working insane hours. Be excellent. Put in the time. Just not too much. p.s. I share the 40 Hour Teacher Workweek Club because of all the reasons above - because it is AMAZING and I know it will be a huge help. To be fully transparent, I want you to know that I am also an affiliate for the club - which means if you choose to enroll after clicking one of the links above, Teach 4 the Heart will receive a percentage of your enrollment at no extra cost to you. Thanks for helping support Teach 4 the Heart in this way. I have been teaching for 16 years and I do feel overwhelmed… even after 16 years! I felt like you were speaking to me during this podcast. I have improved on becoming more effective in either letting things go or finding a better alternative, however I still feel stressed. I struggle with letting “school/work” go when I get home or when I am with friends/family. I think about what I can do in my classroom… even on the weekends… even when I am grading papers! 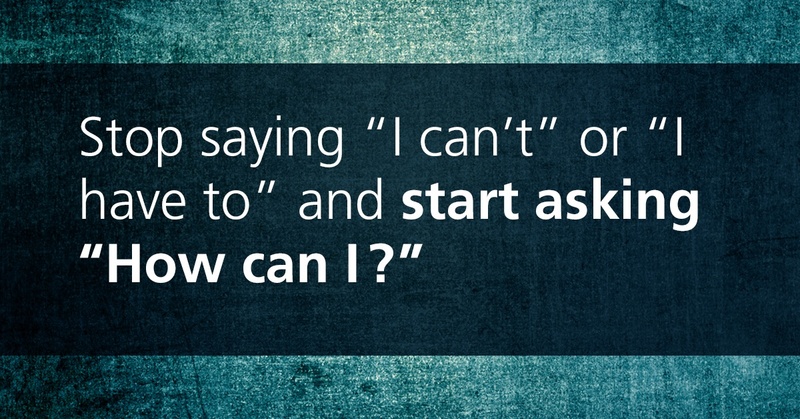 I like how changing my language can help me change my mindset and ultimately my productivity. I look forward to taking on the challenge to feel more energized, effective, and have a renewed mindset about teaching again. Thank you!! !